Our original, quality, patented, Mil-Spec Ambidextrous Magazine Release, the Ambi-Catch™, has been used in combat by USMC MARSOC in Afghanistan and Iraq. 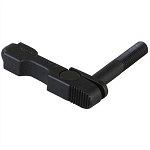 None of the other "drop-in" ambidextrous magazine releases manufactured by our competitors can claim this. The Ambi-Catch™ is currently issued to US Marines (CQBW-MARSOC) and is authorized for use in all USMC M16 Rifles and M4 Carbines. Canada (C7A2 Rifle and C8A3 Carbine) and Denmark (M/10 Carbine) are using our release in their "Issue" weapons. The Ambi-Catch™ is also included in the United Kingdom's new L119A2, Standard Carbine & CQB Upgrade. Law Enforcement individuals and organizations should take note of the fact that the Ambi-Catch™ was extensively tested and approved for use by the FBI. The Ambi-Catch™ is also currently in use by the US Secret Service, US Capitol Police, US Marshals Service, US Border Patrol (SWAT Team), US State Department (MSD-DSS) and the Drug Enforcement Administration. Civilian users can benefit from the use of our product to protect themselves in an urban environment. Your investment in the Ambi-Catch™ as a tactical upgrade will enhance your ability to engage adversaries from both sides of the weapon and improve your chances of surviving a shooting event. The Norgon Ambi-Catch™ is made in the USA and has a Lifetime Guarantee. If you break it, we replace it (normal use). If you wear out a spring, we will send you a replacement. No one else offers this level of support.